JNN 07 Aug 2015 Baghdad : Iraqi warplanes targeted ISIL positions in many areas across the country, leaving nearly 70 terrorists dead. On Friday, the Iraqi airstrikes targeted ISIL positions in Jouibah district to the East of the city of Ramadi in Anbar province, killing 60 Takfiri Terrorists, according to the Arabic-language Alforat News Agency. 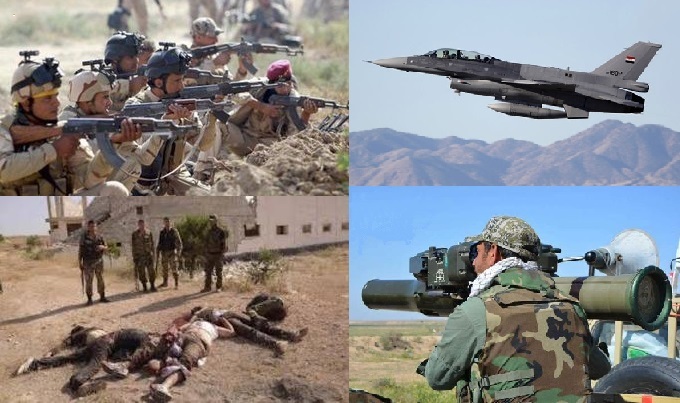 In another development Media War Cell announced on Friday the killing of seven members of the ISIS organization and injuring 12 others, in addition to destroying 3 vehicles in an aerial bombing south of Mosul. “The operation resulted in the killing of seven members of ISIS and wounding 12 others, as well as the destruction of three vehicles,” the cell added. The Iraqi Ministry of Interior said on Sunday, that the joint security forces had managed to kill 30 terrorists north of the city of Ramadi. Iranian made TOW ATGM (Toophan) are now also used in Anbar. An ISIS convoy was targeted near Tel Msheehd, Eastern Ramadi. This TOW ATGM has the Iran electronics industry green tape. So far, only Badr linked fighters were seen with Iranian TOW ATGM. Media War Cell announced on Friday killing 25 Chechen suicide bombers that were planning to attack the city of Samarra during an operation that resulted in killing 124 Terrorists of the organization and the destruction of 12 vehicles and two boats in the provinces of Kirkuk, Salahuddin and Anbar. The ISIL Takfiri terrorists currently control shrinking swathes of Syria and Iraq. They have threatened all communities, including Shiites, Sunnis, Kurds, Christians, Ezadi Kurds and others, as they continue their atrocities in Iraq. Senior Iraqi and Syrian officials have blamed Saudi Arabia, Qatar, and some Persian Gulf Arab states for the growing terrorism in their country. The ISIL has links with Saudi intelligence and is believed to be indirectly supported by the Israeli regime. This entry was posted in Iraq News, Middle East and tagged Anbar Province, armored vehicles, Iraq, Iraqi Ministry of Interior, ISIL, ISIS, Ramadi, security forces, Shia Militias, Terrorists. Bookmark the permalink.